Researchers at Polytechnic Institute of New York University (NYU-Poly) have assembled a powerful consortium of government and business support to advance beyond today's fourth generation (4G) wireless technologies toward 5G cellular networks that could potentially increase cell phone capacity by more than 1,000 times. The National Science Foundation (NSF) has awarded the team an Accelerating Innovation Research (AIR) grant of $800,000, matched by $1.2 million from corporate backers and the Empire State Development Division of Science, Technology & Innovation (NYSTAR), which supports the project through its longstanding partnership with NYU-Poly's Center for Advanced Technology in Telecommunications (CATT). Industrial partners include InterDigital, National Instruments (NI) and faculty startup company Asension Laboratories. "This new collaboration will significantly accelerate the progress towards 5G, and it exemplifies the power of NYU-Poly's philosophy of i2e  invention, innovation and entrepreneurship," said NYU-Poly President Jerry M. Hultin. "The team is built of experienced faculty entrepreneurs and highly innovative researchers. Students will learn how to create products and companies, working beside these professors and researchers from blue ribbon companies." "Bandwidth-hungry devices are doubling wireless spectrum demand every 12 to 18 months," said Professor Shivendra Panwar, principal investigator on the 5G project, CATT director and professor in NYU-Poly's Department of Electrical and Computer and Engineering. "The 4G wireless networks increased the efficiency of spectrum usage, but this project pursues disruptive technologies that will significantly relieve the pressure." The move to the relatively unused and inexpensive millimeter-wave spectrum is being led by Professor Theodore (Ted) Rappaport. He recently joined the NYU and NYU-Poly faculty and is launching the world's first academic research center that combines wireless communications with computing and medical applications. The internationally recognized wireless expert is co-principal investigator of the project and directs the NSF's Wireless Internet Center for Advanced Technology (WICAT) at NYU-Poly, where most of the project's research will be conducted. The industrial partners' labs will also conduct research. "Millimeter wave communications are the next frontier of the wireless age," predicted Rappaport, who is also a professor at NYU's Courant Institute of Mathematical Sciences and in the Department of Radiology at NYU Langone Medical Center. "Early equipment is already on the market, and major corporations are investing substantially in the technology. This 5G project will offer tremendous value to the $1 trillion cellular industry, including helping to develop standards that will enable others to accelerate their research." Other WICAT faculty researchers include Associate Professor Sundeep Rangan, who leads the team's work on limiting the interference in small (femto) cells. Rangan co-founded Flarion Technologies, which pioneered technologies that have evolved into today's LTE and WiMax cellular network standards. Flarion was acquired by Qualcomm for $800 million in 2006. Professor Elza Erkip is a pioneer in relaying and cooperative communications and a member of the Board of Governors of the IEEE Information Theory Society. Research Assistant Professor Pei Liu implemented one of the first cooperative systems in a university test bed. 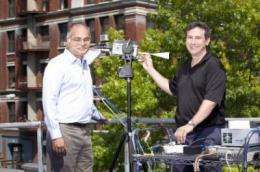 NYU-Poly Industry Professor Michael Knox, founder of Asension Laboratories, will lead research into full duplex antenna technology that enables simultaneous transmission and reception on the same RF carrier frequency while operating through a patented single antenna element, effectively doubling capacity. Among the major wireless companies that are partners are National Instruments, a leading producer of test and measurement equipment enabling a powerful graphical system design approach with integrated software and hardware platforms that speed the development of engineering systems; and InterDigital, a longtime NYU-Poly collaborator that develops fundamental wireless technologies for mobile devices, networks and services worldwide. Hardware and software from NI will serve as the test bed for these 5G research initiatives to be proved quickly through rapid iteration capabilities. The project is supported by the NSF's AIR program, which creates research alliances between existing NSF-funded consortia and partners from the world of business and entrepreneurship. These awards were designed to accelerate the innovation of products, processes and/or systems built upon the research foundations of each consortium. The WICAT center at NYU-Poly is among the largest industrial-academic consortia supported by NSF and includes the University of Virginia, Virginia Tech, Auburn University, and The University of Texas at Austin.